In Special Needs Life Skills, our students learn a variety of functions that will enable them to navigate the world. Unfortunately, the world outside the center does not accommodate to their skill level. This service helps our students build confidence in an environment that is both encouraging and safe. Students also learn many other functional living skills needed to develop self-confidence and greater independence. Read on to see what else our students learn in Special Needs Life Skills. What Happens in the Life Skills Lab? Sometimes traditional methods of writing are not intuitive for our students. Because of this, we work with more tactile materials to help them spell or recognize their own names. We have a makeshift bedroom set up in the Life Skills Lab. Within it, our students learn how to make the bed. This process involves dressing pillows in cases, fitting sheets to the bed frame and turning down comforters. 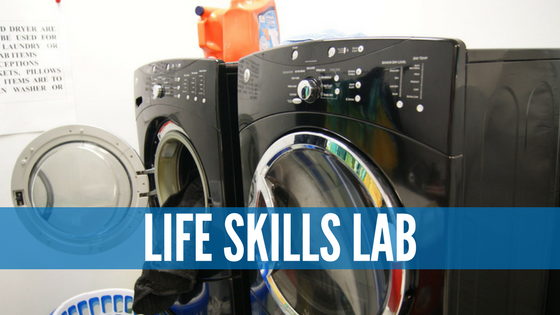 A full-size washer and dryer set is fashioned in a small nook in the Life Skills Lab that allows students the space to learn how to load the washer, transfer clothes from one machine to the next, sort laundry and fold and hang clothes. The students are tasks with making an assortment of recipes with the supervision of our caring, passionate staff members. We have a state-of-the-art stovetop that is designed to only keep cooking materials but not hands. This way students can learn how to provide a meal for themselves or their loved ones without being hurt in the process. A dishwasher is set up in the Life Skills Lab so students can learn how to properly and effectively load and unload a dishwasher. We have a full-size bathroom, complete with a shower and tub, set up in the Life Skills Lab so the students can practice getting safely in and out of the tub. Using this attached bathroom, we also teach students how to brush their teeth, washing their face, combing their hair, etc. We teach our student basic manners, such as not to interrupt people or talk over someone when they’re talking, to say “please” when they want something and “thank you” when they get it, to speak softly when talking to someone at close range, etc. Students are not only tasked with making simple snacks and meals, but they are also asked to make healthier choices when choosing ingredients and meal choices. Together, we learn why some foods are healthier than others and how we can choose them over options with trans- and saturated fats.